These Baked Potato Wedges are flavored with garlic, herbs and lemon zest, then baked until crisp-tender. They make a delicious and easy side dish for steak, chicken or fish! My husband and I ate half of these Baked Potato Wedges as soon as I took my last photo. That’s how delicious they are. Garlicky potatoes seasoned with rosemary and thyme. So good! The lemon zest adds a hint of brightness to this dish that I really like. It’s just a subtle note of extra flavor. Our Kroger sells little packets of “poultry blend” herbs, which includes rosemary, thyme, and sage. If you have a Kroger store nearby, you can find them with the Simple Truth organic herbs in the plastic packets. I’m not sure if any other brands do this, but check your local supermarket for them. It’s a money saver because it costs the same as one packet and you get both herbs you need for this dish. Plus, you don’t end up with a bunch herbs that you have to figure out what to do with. Baked Potato Wedges are simple to make, and are a healthy side dish that your whole family will love. Of course, if you’d like less garlic flavor, you can certainly use less. Me? I’m a big garlic fan, so it’s all going in. 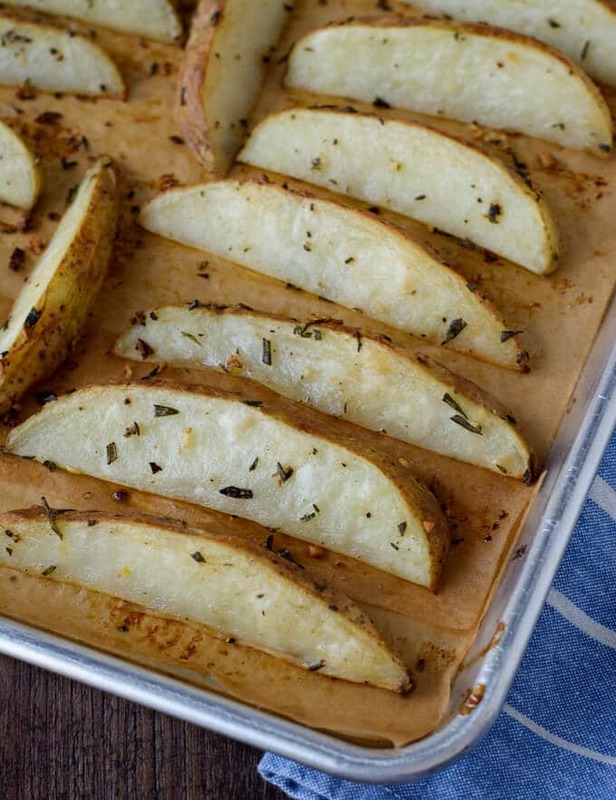 Put your cut potatoes on a baking sheet, then drizzle olive oil over them. Sprinkle herbs, garlic and lemon zest over them and toss to coat. Spread out on the baking sheet and bake until light golden brown, tender on the inside and crisp on the outside. This will take somewhere between 25-30 minutes. These are best eaten right away, but they can be reheated if you have leftovers. Preheat oven to 425°F and line baking sheet with parchment paper. Place the leftover potato wedges onto the pan and place into the oven. Bake for ten minutes, flipping the potatoes halfway through. *Look the potatoes over carefully to make sure there aren’t any sprouts on them. If you can find organic potatoes, even better. Our Kroger sells organic russet potatoes in bags and individually. 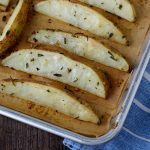 Super flavorful and delicious, these Baked Potato Wedges make a delicious side dish for steak, chicken or fish! Cut the potatoes in half lengthwise, then cut each into 4 wedges lengthwise. You'll have 8 long wedges from each potato. 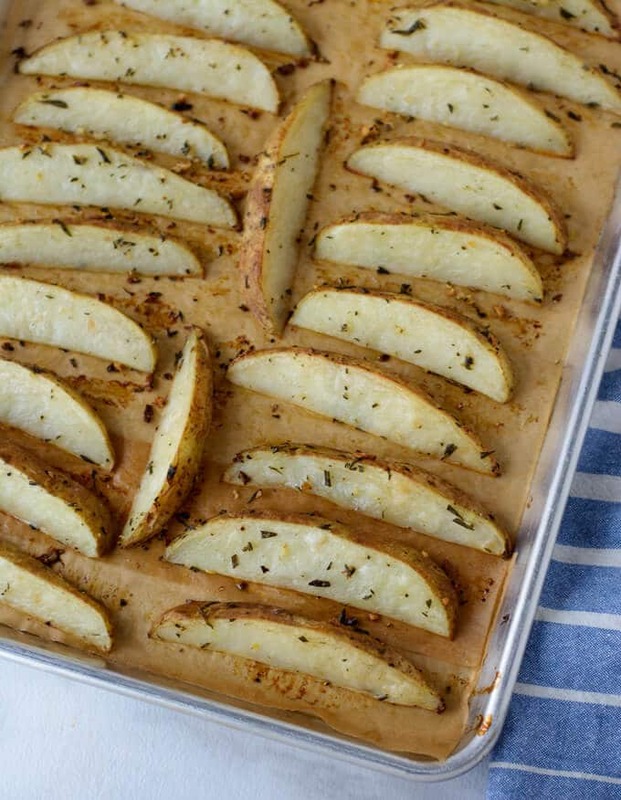 Place the potatoes on a sheet pan, drizzle with olive oil, sprinkle the salt, pepper, garlic, rosemary, thyme and lemon zest (if using) over the potatoes. Toss all the ingredients together, making sure that the potatoes are covered with the oil. Spread the potatoes out in a single layer cut-side down. Bake the potatoes for 25 to 30 minutes, turning to the other cut side after about 15 minutes. Bake until they are lightly browned, tender inside, and crisp outside. Sprinkle with more salt if needed, then serve. 1.The lemon zest is optional, I like that it adds a brightness to the potatoes. 2.To reheat leftovers: Preheat oven to 425°F and line baking sheet with parchment paper. Place the leftover potato wedges onto the pan and place into the oven. Bake for ten minutes, flipping the potatoes halfway through. 3.I don't recommend using dried rosemary, but you can use dried thyme if you want. Dried rosemary just isn't as aromatic or good in my opinion. Estimated Nutrition Facts based on 6 wedges per person. By Tempie at March 15, 2018 .